Dining at La Hacienda de San Angel ~ with pics! 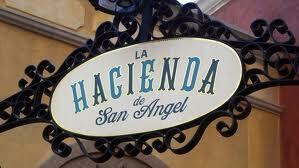 On a previous trip to Walt Disney World, my husband and I made a visit to La Hacienda de San Angel. This was our first visit and we were super excited to try it out!We got over to La Hacienda de San Angel just in time to check in. We stood outside in line for a few minutes and then we were sent inside. Here are the beautiful lights inside the waiting area: They seated us shortly. Here was a view from our seat to World Showcase lagoon. First we were brought chips and two dipping sauces. We got to discussing with our wonderful waitress about the spiciness of the sauces and the “spicy” red one was just not spicy to our Texas tongues so she brought us some seriously spicy sauce that just couldn’t eat! REALLY Spicy Sauce: Next she brought out our appetizer: Taquiza – taco trio featuring Rib eye taco with chipolte salsa, roasted chicken taco with salsa verde, and Chilorio (marinated pork) taco This was really delicious. We asked our waitress what they categorize the food at the restaurant as and she said “contemporary Mexican” whereas the food at San Angel Inn inside the pavilion is supposed to be “traditional Mexican”. We definitely love the contemporary style the best… even better than our coveted Tex-Mex at home. Next came our entrée: La Hacienda – Mixed grill offering flank steak, chicken al pastor, chorizo and vegetables, served with beans and fresh salsas WOW!! This was just really delicious. You could make these little fajitas with everything they gave you. We enjoyed the spices and flavors and the food tasted fresh. We decided we also wanted to try out a dessert: Empanada de Manzana – puff pastry filled with sauteed caramel apples and vanilla bean ice cream with Kahlua sauce This was tasty but not the highlight of our meal. That vanilla bean ice cream with the Kahlua sauce was probably better than the empanada itself. Overall we were super impressed with our meal. We would book this again in a heartbeat! For guests who wish to dine at La Hacienda and are on the Disney Dining Plan, the meal will use one table service credit. The 2013 Flower & Garden Festival ~ all the details!